1966 5 9 Have You Seen Your Mother, Baby.? Note: 'NR' stands for 'Not Released'. 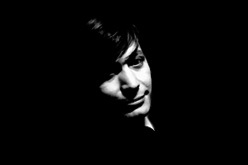 More detailed information on the charts, their estimation and records sales is available at BeatZenith and Wikipedia. 'Sad Day' was released as a 7" single in the UK on April 27, 1973. Originally recorded on December 3, 1965, and released first in the US as a B-side of '19th Nervous Breakdown' on February 11, 1966, 'Sad Day' was issued in 1973 as a single in the UK - and most of the world but the US - and was an attempt for Decca to promote the band's back catalogue through the compilation album 'No Stone Unturned' [supposedly B-sides and rare tracks]. Nearly 80 songs recorded by the Rolling Stones entered either the UK or US charts since 1963, twelve of them peaking at #1 ['Satisfaction', 'Get Off Of My Cloud', 'Paint It, Black' and 'Honky Tonk Women' were #1 in both countries]. The early years also were the most prolific and, whereas most titles were not yet penned by the Jagger-Richards tandem, record labels Decca [in the UK] and London [in the US] would issue singles at a frantic pace, building the band's reputation as the Beatles' most serious threat. However, no global marketing strategy would emerge before the 70's, and both countries cultivated their differences in their respective discographies, as would their affiliates in other parts of the world. 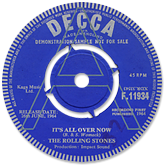 The richness and diversity of the Rolling Stones singles discography is mainly due to the fact that, during the 60's, Decca would consider singles an independent market from the LPs' one, whereas London would use this format as a 'lift' for album sales. Therefore, British singles would offer non-album tracks [except for compilations], and Decca England would pass on a few US releases, while the US would opt for different B-sides and be a little more productive. US exclusive couplings and singles would however often be released on Decca in Europe, notably in Scandinavia for which UK would exclusively press 'export' singles [Scandinavian countries also pressed their own records and imported regular UK releases, see the Danish, Swedish and Norwegian discographies]. In order to access all 7" releases for a specific title, use the search engine above. Members can access any song at anytime.